As the five-year term of the Pakistan Muslim League-Nawaz (PMLN) government draws to a close, a great deal of analysis will focus on the political tumult overshadowing its last 12 months in office. At one level, this is completely justified: the party saw its founding leader and elected prime minister disqualified over a graft scandal in July 2017 as well as the opening of lengthy accountability proceedings to go alongside it. It has also seen unprecedented amounts of judicial activism and, more familiarly, a resurgent military flexing its muscles in the public domain. Finally, as is usually the case ahead of a general election, the political landscape is coloured by the dubious confetti of defections and exits as freelancing politicians seek to secure their future in the next dispensation. With a setting like this, what else is news media supposed to focus on? The truth is that there is still a lot to take stock of. Pakistan’s democratic transition is now in its 10th year. While there are legitimate questions surrounding the quality and depth of democracy in the country, along with the usual concerns about whether it will survive beyond this summer, there is also something to be said about the social normalisation of a government that displays a civilian face. The public at large takes some of its cues from the mainstream news media’s discourse, which remains fixated on elite politics and institutional conflicts, but most of the people’s everyday bandwidth of concern and perception is consumed by issues of service delivery and governance. That is, after all, the most frequently encountered aspect of politics. Given this context, it makes sense for an end-of-term analysis to divert at least some of its attention to two things — performance in government and the perception of this performance by the electorate. While being closely interrelated, one cannot be collapsed into the other. The way they play out in reality is at two different levels: performance in government is usually measured through a series of benchmarks, some developed by the ruling party through its manifesto commitments and annual agenda setting and others by an academically informed and technocratic view of development and competence. On the other hand, perceptions of performance – the concern of this particular piece – are conditioned by a wider array of factors that include, first and foremost, the real life experience of individuals and its comparison with previous time periods and, to a lesser extent, with expert analysis and the public relations campaigns of the government. In this sense, performance analysis by experts might see a particular governing term as largely competent in moving things in the right direction (with due consideration to contextual factors) but the public level of analysis might register apathy and anger. As a rule, perceptions are less likely to take into account contextual factors – for example, global and domestic complications – and are more likely to be based on very personalised assessments dictated by deeply held views and lived experiences. Ultimately, public perceptions also have a big impact in the shape of voting sentiment towards the incumbent. Thus a government besieged by factors out of its control could be punished by an electorate that usually does not allocate marks or leniency for such things. A prime example of this is both the last government (2008-2013) led by Pakistan Peoples Party (PPP) and, next door in India, the second Congress-led government that presided over a slowdown in the economy well beyond its control. A consequence was thumping victories for the opposition in the subsequent elections – PMLN in 2013 and the Bharatiya Janata Party in 2014. Many new developments have given an unprecedented opportunity to voters and analysts to develop discrete views about government performance. Other than the (partial) stability provided by two successive civilian governments, these include the 2013 election results as well as the revision of Pakistan’s governing architecture under the 7th National Finance Commission Award and the 18th Constitutional Amendment. Each of the three main parties, PMLN, Pakistan Tehreek-e-Insaf (PTI) and PPP, formed provincial governments that are better resourced than ever before and PMLN also took up reins at the centre, allowing voters to see the practice of different visions in government. Unlike previous periods when different parties administered different tiers of government, the amount of legislative, administrative and fiscal space available to provinces (and, potentially, to local governments) 2013 onwards has been unprecedented. These last five years have provided enough time and space to the political parties in power to demonstrate their performance to citizens through different strategies for development and service delivery. For example, PMLN’s focus in Punjab remained on infrastructure and private sector development, PTI’s in Khyber Pakhtunkhwa on human development and institutional strengthening and PPP’s in Sindh on rights allocation and legislation. The impact of these development approaches has been experienced by citizens at different levels. This has likely informed the citizens’ opinion about the relative performance of elected governments in their respective provinces, as well as of PMLN at the federal/national level. A perception survey in the twilight of a five-year term may not provide an ‘objective’ measure of performance but it will provide insight into how voters evaluate various parties ahead of a general election. This, in turn, is useful from a predictive angle and can also help in introducing a citizens’ perspective in the otherwise skewed focus placed on elite machinations by traditional media discourse. This survey, financially and technically supported by the Sustainable Development Policy Institute, an Islamabad-based independent think tank, was carried out in the first two weeks of April 2018 in 136 districts and regions across Pakistan. Chosen in accordance with the 2017 census data, the total number of respondents who participated in the survey was 1,497; 849 males and 648 females. They were further divided by locality: 652 respondents were from urban areas and 845 from rural areas. Respondents were also split on the basis of provinces and regions: 794 were from Punjab, 348 from Sindh, 219 from Khyber Pakhtunkhwa, 88 from Balochistan, 34 from the Federally Administered Tribal Areas (Fata) and 14 from Islamabad. The last parameter for division was mother language: 584 were Punjabi speakers, 266 were Pashto speakers, 231 were Urdu speakers, 216 were Sindhi speakers, 87 were Seraiki speakers, 61 were Balochi speakers, 20 were Hindko speakers, 8 were Gujarati speakers and 24 respondents spoke other languages. was already besieged by a number of political controversies and adverse court rulings. Hence it is difficult to both ascertain the degree to which these shaped the perception of the respondents and disentangle their impact from what would be considered non-distorted perceptions of performance. Nationally, PMLN’s performance has not produced drastically negative or positive perceptions. Nearly 42 per cent of the respondents think the federal government has done an ‘average’ job in power. On either side of this middling perception, respondents are roughly balanced: 18 per cent give the government an ‘above average’ score and another 12 per cent perceive its tenure in power as ‘excellent’; similarly, answers that fall on the negative side of the scale cumulatively account for 27 per cent of the total (17 per cent ‘below average’ and 10 per cent ‘very poor’). While there is no comparable data from five years ago, it is safe to posit that in the absence of starkly negative views, the PMLN government is in healthier shape, in terms of voter perceptions, than the previous incumbent was going into an election. There is also no substantive difference in these perceptions across gender and the rural/urban divide, with each sub-strata producing similar responses. From a political economy perspective, despite the incumbent’s characterisation as an administration with a heavy urban bias (at least in its first three years) and the broader stagnation of the rural economy which led to negative growth in agriculture in 2016-17, there appears to be no major penalty being levied by the rural respondents. One possible explanation is that the belated agricultural package, announced in the previous federal budget, may have helped placate rural anger. 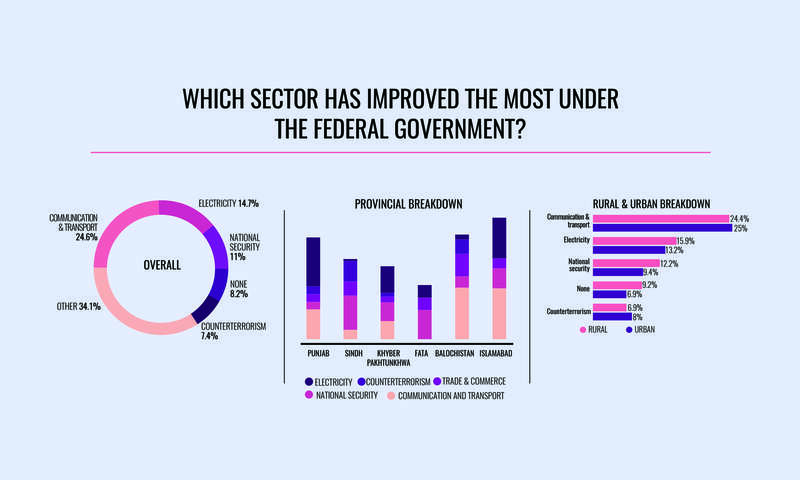 As expected, much of the goodwill accumulated by the federal government comes from its performance in the communication and transport domain (largely road and highway building): 25 per cent of the respondents state it as the best-performing sector for the last four years. Another 15 per cent point out the federal government’s relative success in reducing load-shedding as a strong performance indicator and 11 per cent give it credit for improving national security. This sits well with the consistent decline in terrorist attacks recorded since 2014. The data shows that, unlike positive outcomes, no one or two negative markers dominate the citizens’ perceptions of the federal government. 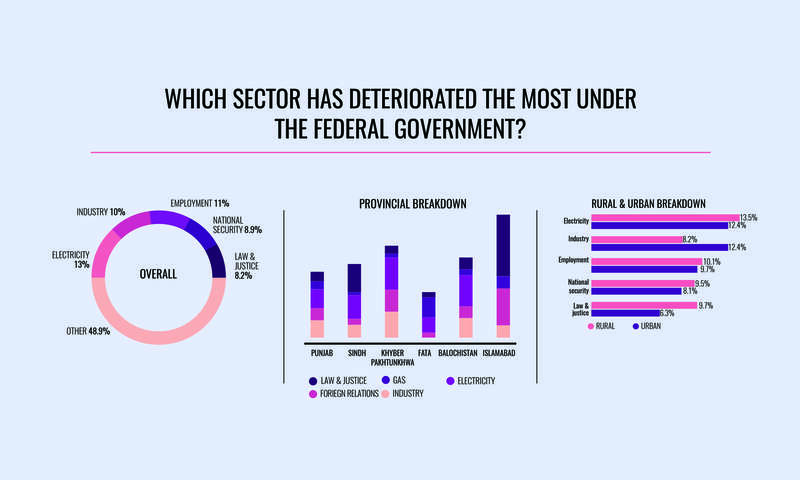 Sectors considered to have deteriorated under the incumbent’s administration include electricity, job creation and law and justice, each of which is cited by approximately 10 per cent of the respondents. While the first could be a function of unmet expectations, as citizens expected load-shedding to be completely eliminated, the latter two are emblematic of structural problems in the economy and governance. For four years, the federal government was largely synonymous with Nawaz Sharif, given the high degree of centralisation of executive authority exercised in his tenure. Interestingly, however, perceptions deviate considerably when he is juxtaposed with his own government. Part of this could be down to the political controversies that may have potentially coloured the respondents’ perceptions of the disqualified prime minister. Overall, a much higher percentage (42 per cent) feel that Nawaz Sharif’s performance was below average or very poor while only 13 per cent give him an ‘excellent’ rating. Given the geographically concentrated bases of support for the ruling party, it makes sense to parse favourability results at a provincial level. As one would expect, positive views about Nawaz Sharif rise from 19 per cent nationally to nearly 28 per cent if only respondents from Punjab are considered. In the absence of time-series data, however, it is hard to suggest what that means for the ruling party or for the narrative of victimisation being propagated by Nawaz Sharif and his daughter. All it tells us is that PMLN continues to be competitive in its home province of Punjab. Development experts and policy analysts generally consider Punjab to be the best governed province. There is sufficient evidence to suggest the economy and social sectors of Punjab outperform other provinces and regions, contributing to its general prosperity. These objective assessments are also acknowledged, to varying degrees, by the citizens of the province. When asked about the Punjab government’s performance, a plurality of the respondents (39 per cent) cite it as ‘average’. However, another 29 per cent give a positive appraisal (above ‘average’ and ‘excellent’) while the remaining 19 per cent respond in the negative. Crucially though, only 12 per cent think the government’s performance was ‘very poor’. These figures are roughly in line with the appraisal of the federal government and suggest that the ruling party has spent its second successive term in power in the most populous province without accumulating too much negativity. One of the factors frequently cited for the provincial government’s relative competence has been the performance of PMLN’s new president and decade-long incumbent Chief Minister Shehbaz Sharif. The survey data broadly confirms this consensus. 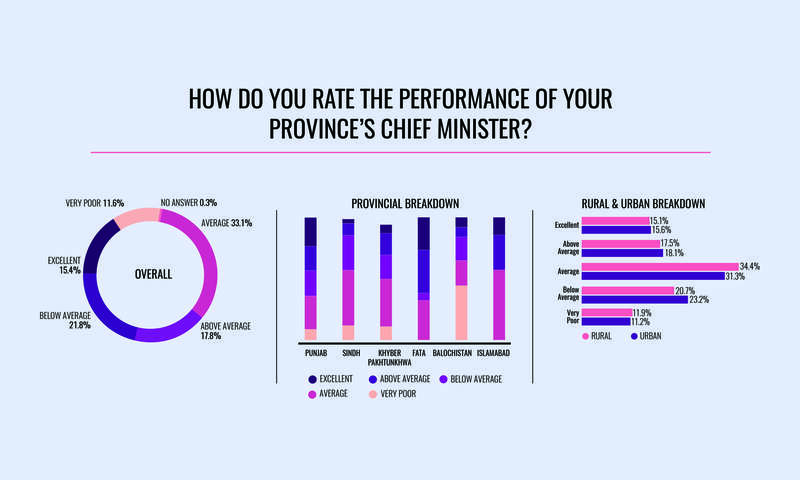 Nearly 47 per cent of the respondents in Punjab give a positive appraisal of the chief minister, with 23 per cent stating that his performance has been excellent. Only 9 per cent of the respondents feel his performance has been very poor. From the point of view of the upcoming election, Shehbaz Sharif’s continued popularity and his ability to curtail negative perceptions among voters in Punjab will be key for PMLN. Of further interest here is how his popularity in the province outstrips Nawaz Sharif’s in the light of recent scandals. 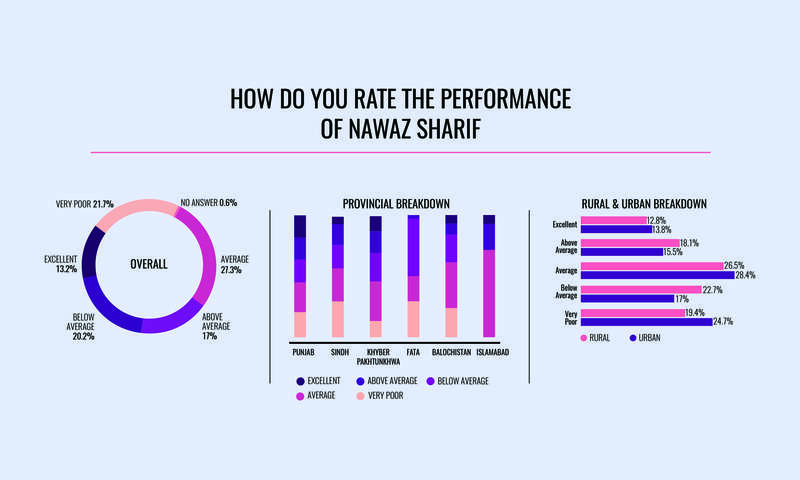 Compared to Shehbaz Sharif, 5 per cent fewer respondents feel Nawaz Sharif’s performance in office was ‘excellent’ while there is a 12 per cent increase in those who feel his performance was ‘very poor’ compared to that of his younger brother. This means that at the moment in Punjab not only does Nawaz Sharif invoke less goodwill on the basis of his performance, he also polarises more people in the negative direction. Resultantly, it can be hypothesised that Shehbaz Sharif taking centre stage in the party ahead of the 2018 election is likely to keep more voters in PMLN’s camp. Where does this positive sentiment for the Punjab government emerge from? 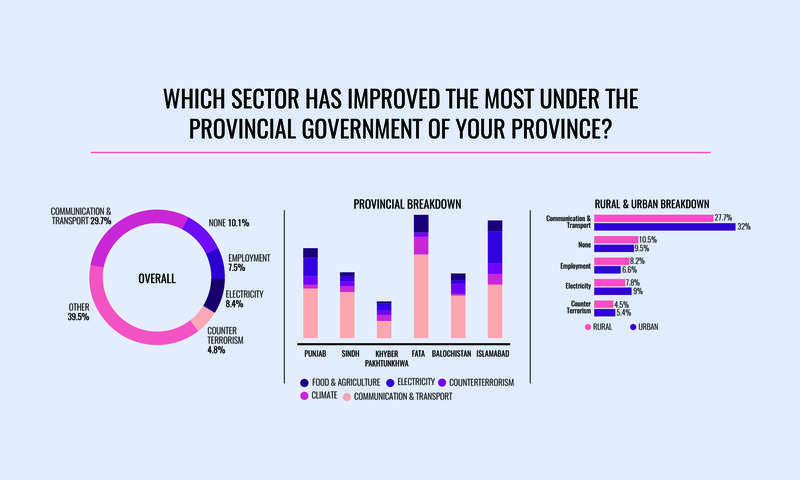 As with the federal government, the respondents cite communications and transport (35 per cent) and electricity (21 per cent) as the two main sectors of competent performance on the part of the provincial government. This also means that there has been some progress on the manifesto commitments made by the ruling party in 2013, as infrastructure development and energy supply were two of its manifesto’s central pillars. On the other hand, no dominant area of deterioration has been identified by the respondents. This suggests no glaring source of incompetence or inefficiency in governance. PTI’s government in Khyber Pakhtunkhwa has attempted to fashion a different development trajectory by focusing on social sector reform and institutional development. infrastructure projects in the province, with the most prominent being the Peshawar Bus Rapid Transit system currently under construction. This departure from a more ‘tried and tested’ form of gaining public approval has not yet been interrogated in detail. Going by the perception of Khyber Pakhtunkhwa’s residents, the results are not discouraging. 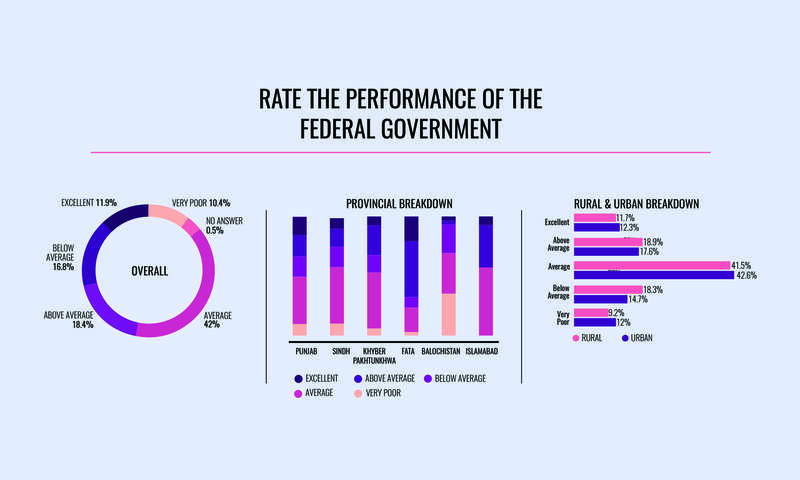 As with Punjab and the federal government, a plurality (42 per cent) have found the performance of the provincial government to be ‘average’. On the positive end, 25 per cent perceive it to be ‘above average’ while 8 per cent have marked it as ‘excellent’. In contrast, 25 per cent register negative views. On their own, the figures may not look impressive. But when seen in the light of volatile electoral history of the province, it seems the voters have responded well enough to the government’s overall vision. 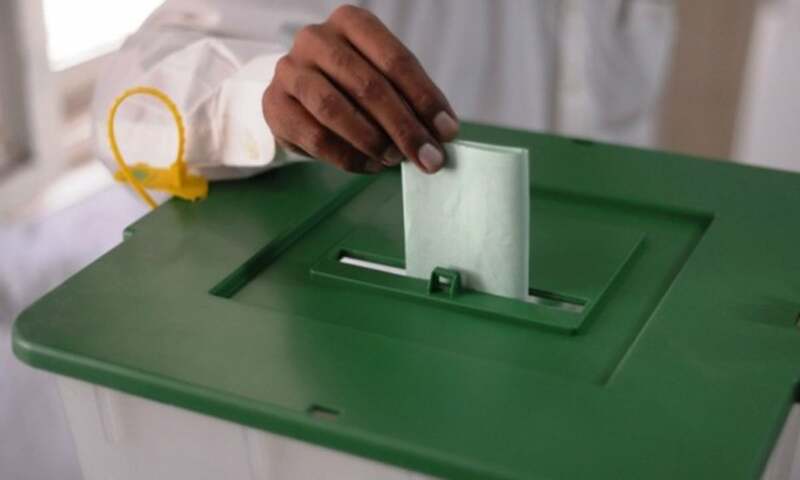 Going into an election with a reasonable chance of being re-elected has generally been thought of as impossible for incumbents in Khyber Pakhtunkhwa. Thus PTI has certainly done well to remain electorally competitive. This leaves open the question of attribution. Is the appraisal of the provincial government tied to Chief Minister Pervez Khattak’s performance or has it been perceived as a broader project? The respondents’ views about Khattak are evenly distributed, with 31 per cent citing negative perceptions, 31 per cent holding positive views and the rest falling in the middle. This means that his impact has not been central in shaping overall views about the provincial government’s performance, which is in line with the institutionalised model of governance pursued by PTI. The party’s first stint in power has seen the citizens appreciate positive developments in employment/job creation, which is cited by nearly 23 per cent of the respondents from the province. This is likely an outcome of economic normalcy returning to the province after a decade of terrorism that instigated capital and human resource flight to other parts of the country. While it is hard to draw a causal link between the provincial government’s policy framework and this positive development, the fact that it is being perceived as linked by the respondents bodes well for the party. This is largely an example of the context and structural factors working in favour of the incumbent. Conversely, the survey results show electricity as the only sector which 13 per cent of the respondents perceive has deteriorated in the last five years. This, as mentioned earlier, could be a function of unmet expectations or general apathy towards the government for not working harder to find more localised solutions to the problem. As with PMLN in Punjab, PPP in Sindh is also finishing its 10th year at the helm of the provincial government. Long thought to be hegemonic in its control of electoral politics in the province, there are signs of growing dissatisfaction with the party, even in its traditional rural strongholds. Overall, 42 per cent of the respondents feel the government’s performance has been negative while only 16 per cent perceive it to be positive. The rest give an average score. Given its history and the demographic and ethnic make-up of the province, negative perceptions of the provincial government’s performance are most strongly found in urban areas such as Karachi. These areas have long been neglected by the provincial government and belated attempts at setting up functional local governments have proven to be thoroughly incapable of addressing developmental concerns. 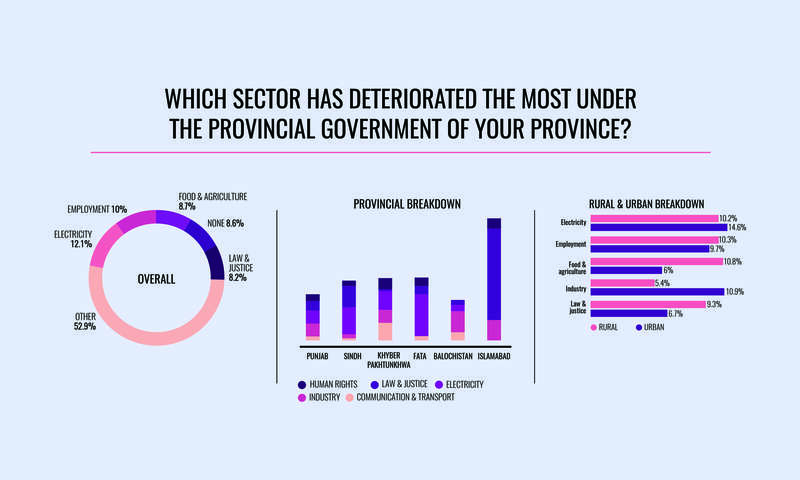 The fact that 49 per cent of the urban respondents in the province hold negative views of the provincial government’s performance is thus not surprising. What remains more telling is that the same perception of negativity holds even for the rural respondents. This is a clear indication that the rural residents are evaluating the PPP government along their own performance-based measures and finding it to be inadequate. To recalibrate this image as an inefficient party in government, PPP passed on the chief ministerial reins to Murad Ali Shah, a younger and more technocratic politician than his predecessor. However, this move does not appear to have changed perceptions of the respondents from Sindh, of whom only 13 per cent cite favourable views of him. In contrast, 40 per cent feel that his performance has been ‘below average‘ or ‘very poor’. In terms of sectoral improvement, Sindh government has accrued some positive acclaim for improvements in road and transport infrastructure, which is cited by 30 per cent of the respondents as showing progress. However, 15 per cent say that no sector has shown any progress. The same is said by only 10 per cent in Khyber Pakthunkhwa and 7 per cent in Punjab. What should be a point of concern for PPP is that nearly 18 per cent of the respondents (a plurality) say that performance deterioration is the highest in the food and agriculture sector. This means that the overall stagnation of the sector has been acutely felt in the rural areas of the province. This could potentially result in an electoral penalty. A federally-brokered political settlement between Baloch and Pashtun ethnic parties provided a positive start to the provincial government back in 2013. The elevation of Dr Malik Baloch as the province’s first middle-class chief minister held some promise that the governance rot seen in previous decades might be reversed through dynamic leadership. This did not materialise. The government eventually passed onto a PMLN-affiliated tribal leader and then promptly collapsed ahead of the Senate elections this year due to backdoor machinations and defections. As a result, there has been little focus on socio-economic development. 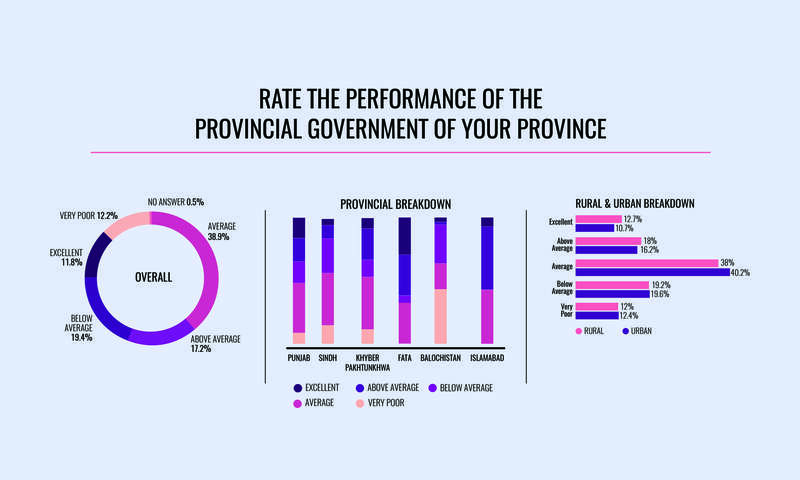 This is reflected in the respondents’ perceptions of the provincial government’s performance, which is the worst out of all the four provinces: 74 per cent of the respondents give a negative appraisal, of which a clear 43 per cent mark the government’s performance as ‘very poor’. This is a clear indication of the scale of dissatisfaction felt by Balochistan’s citizens and a clear indictment of its political elite. The province’s political tumult is also reflected in views about the chief minister’s office, which has seen three different occupants over a five-year period. Almost a clear majority (44 per cent) states that the performance of the occupant of the post has been very poor. This is, again, the worst out of all the four provinces by a large margin of approximately 32 per cent. In the absence of more finely grained data, one can reasonably assume that this negative perception is averaged out across all three politicians who have held the office since 2013. Finally, given these overwhelmingly negative perceptions, it is little surprise that 20 per cent of the respondents feel that no sector has recorded any improvement worth mentioning. On the other hand, sizable segments (18 per cent, 15 per cent and 22 per cent) state that industry, trade and commerce, and agriculture have shown acute deterioration, respectively. The fact that these constitute the three overarching sectors of the provincial economy is both indicative of the complete failure of governance and the continued pressures exerted by a disabling structural environment. The results of the perception survey show heightened dissatisfaction in Sindh and Balochistan and mixed results in Punjab and Khyber Pakhtunkhwa. In the latter two provinces, a middling score (‘average’) has been the largest segment of responses in most domains of evaluation, suggesting that many citizens are sitting on the fence about their incumbent government. For parties competing in these two provinces, this is the segment that will likely swing the election towards or away from them and it will likely swing because of a range of factors mentioned at the start of the piece. All in all, this suggests that the election will be highly competitive. Lastly, one of the recurring themes of analysis that emerged in the aftermath of the 2013 poll results was the growing segregation of voters along provincial lines. Has this segregation retained its shape or have parties been able to use their respective mandates to attract voters in other provinces? When asked “which government performed the best in the last four years?” clear majorities (58 per cent) in both Punjab and Khyber Pakhtunkhwa cite their own PMLN and PTI-led governments, and sizable minorities (30 per cent in Punjab, 26 per cent in Khyber Pakhtunkhwa) cite the rivals. This means that both incumbents have managed to retain a perception of better performance over their rivals in their own provinces while at the same time attracting some segments from across provincial boundaries. On the other hand, respondents in both Sindh (52 per cent) and Balochistan (47 per cent) cite Punjab as the best-performing government over this period, further affirming the heightened dissatisfaction with the status quo. It remains to be seen, however, whether this dissatisfaction will play itself out in the electoral domain. The writer is a columnist for the daily Dawn and a senior consultant responsible for conducting the Periodic Economy Analysis (PEA) for the programme Consolidating Democracy In Pakistan (CDIP). This is the first part of our end-of-term public opinion poll. To read the second part, click here. The dissatisfaction of the people residing in Balochistan is very disheartening, the new government should take notice of this as well. The situation isn't ideal in the rest of Pakistan either, but in Balochistan it seems like the people have suffered more than their share. Punjab has progressed well. All points to PML-N.
PML-N 52% of national votes and majority in parliament. A very well written article based upon deep data analysis. Although the sample size remains questionable if it's actually representative of the population, but it does reveal a lot of underlying details about the perceptions.